If Ignorance is Bliss, Why are People so Angry? Sarah Silverman, the comedian/provocateur, may have provided a valuable service in a roundabout way. I know, I was surprised too. Sarah Silverman has been completely taken in by the notion that America has turned fascist under Trump. Last year she went on Connan O’Brien’s show dressed as Hitler to compare Trump to the 20th Century’s greatest monster. Earlier this month she maybe possibly advocated a military coup to overthrow what she sees as Trump’s fascist regime. 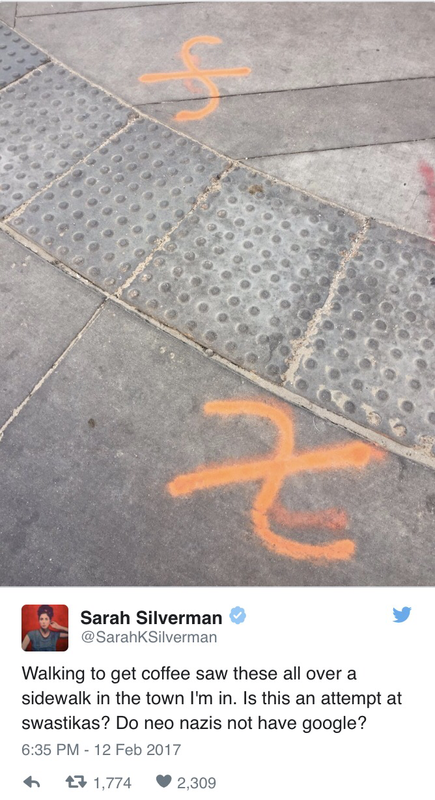 As was quickly pointed out, those are not fancy swastikas, but instead symbols utility workers use to mark underground pipes and other things they do not want to inadvertently damage. The normal response to Silverman’s tweet was to mock her. That’s fair. It was a stupid tweet (and the jokes are pretty good). But I began this post by saying she provided a valuable service, and that is to remind us all of the dangerous trap we can fall into when we assume the worst of others and begin to invent evidence to support our assumptions. Two years ago, I’m sure Silverman could have walked by those very same symbols and not given them a second glance, much less think they were misshapen swazitkas. But now she sees fascism wherever she looks. And no, this isn’t a disease reserved for Hollywood actors. When I first saw Silverman’s tweet, I immediately thought back to a similar tweet from Huffington Post reporter Ryan Reilly. During the Ferguson riots, he saw some ear plugs on the ground and mistook them for rubber bullets. 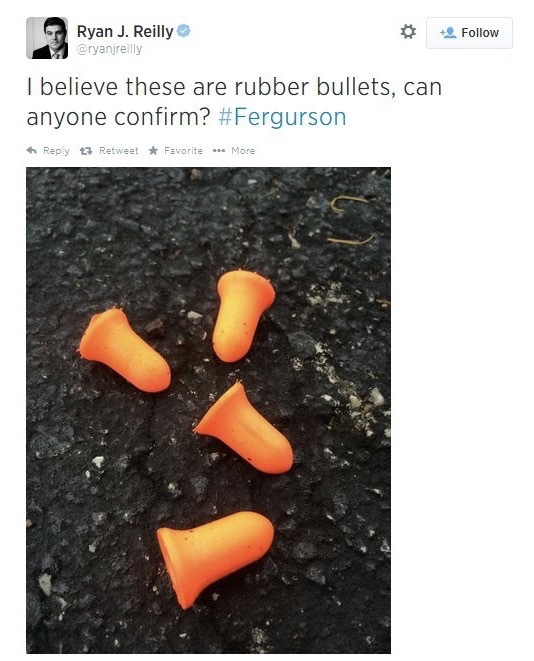 Anyone who knows anything about guns would know those are ear plugs and not rubber bullets. But ear plugs do not support the narrative of an over-militarized and trigger happy police force. The examples go on. Last month a student at Blowling Green State University posted a blurry video of what she assumed to be a KKK meeting on the college campus. What she thought was a klansman in a white robe turned out to be science equipment covered in a sheet. It is ok to not know what ear plugs or rubber bullets look like. I’m sure a large portion of the country would fall into that category. It is also ok to not know what strange looking symbols on the ground are. I would not have known those were utility markings without googling it. And I’m sure we’ve all seen strange shapes through a window and not known what they were. We are all ignorant about some things. The problem comes when people are so wedded to a worldview that they mistake their own ignorance for someone else’s hatred. A little investigation by any of these people would have shown that their fears were unfounded. Instead they assumed the worst and found the evidence to support their fears, even if the evidence is based on ignorance.